On July 21, the most respected Kosova daily, Koha Ditore (Daily Times), reported that two lawyers, a writer, and an ordinary citizen of Prishtina, capital of the territory, had commenced civil legal measures against Shefqet Krasniqi, imam of the city's Grand Mosque, for his hateful remarks about Mother Teresa, made in a sermon two years ago. At that time, Krasniqi declared that the deceased founder of the Missionaries of Charity, considered the outstanding Albanian personality in recent history, was in "the middle of hell, deep," because she was not Muslim. Krasniqi further alleged that notwithstanding her celibacy the Albanian nun "could have all the men she wanted," among other insults. 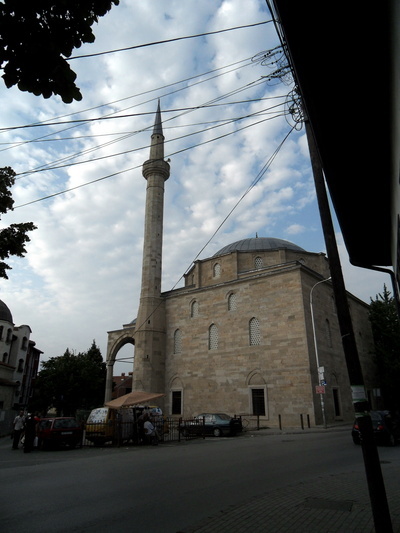 The Grand (Imperial) Mosque, Prishtina, Kosova – Photograph 2010 by Krzystof Dudzik, Via Wikimedia Commons. According to the plaintiffs, Krasniqi's diatribe violated Kosova's law against incitement of religious discord. The status of the case is unclear; Kosova's legal system is run by the European Union Rule of Law Mission in Kosovo (EULEX), which has acted inconsistently in applying regulations adopted by the country's parliament, including provisions against hate speech. In addition, some Albanians presume that Krasniqi may claim successfully that his statements were protected constitutionally. The most interesting aspect of the controversy, however, was the identity of the four plaintiffs seeking legal redress against the Muslim cleric: the writer Qerim Ujkani, the lawyer Bajram Krasniqi (no relation to the imam—it's a common family name in Kosova), the private citizen Adem Nimani, and the lawyer Zef Prenaj. Judging by their given names, the first three are Muslims by origin and only the last is Catholic. Contrary to foreign expectations, Kosovar Muslims stood up for the sensibilities of their Catholic neighbors. This was but one event that, last week, illustrated the anti-extremist character of Kosova's Muslims. Another came when a local Islamist entity called the "Join!" movement announced new tactics. "Join!" previously organized Muslim prayer services out of doors, demanding construction of a "big mosque" to rival a Catholic cathedral under construction in the city. But Prishtina has 22 mosques, and claims by the "Join!" radicals that these were insufficient for the use of Muslim believers brought little support to "Join!" or its leading spokesman, Fuad Ramiqi, an Islamist agitator involved in last year's pro-Hamas flotilla that attempted to evade Israeli naval patrols at Gaza. "Join!" and Ramiqi have now revived agitation over an old grievance and produced a fresh one. Ramiqi's organization, the Muslim Forum of Kosova—affiliated with the fundamentalist European Muslim Network headed by Qatar-based radical cleric Yusuf al-Qaradawi and Euro-Islamist philosopher Tariq Ramadan—had complained in 2007 about restrictions on wearing of the headscarf (hijab) by Muslim girls attending public primary and secondary schools in the Balkan republic. Kosova is a constitutionally secular state, and the headscarf has provoked several such debates. Kosova minister of education, science, and technology Rame Buja, in attempting to calm the confrontation, has said that Muslim parents need not worry that their daughters, if they don hijab, will be excluded from the schools. In a similar ameliorative mode, the Prishtina municipal authorities have promised to find a place for the "big mosque" demanded by Ramiqi and "Join!" But Ramiqi and "Join!" have also called for Blerim Latifi, a sociologist and adviser to Kosova prime minister Hashim Thaçi, to be dismissed for commenting in a televised debate with the journalist Baton Haxhiu on July 1 that the Koran "offers no solution to contemporary problems" and that ideological Islamists are "1,500 years behind the rest of the world." Latifi also derided the penetration of Kosovo by "desert Islam" imported from the Arabian peninsula and contaminated by political ambitions and anti-Americanism. The Islamist group indulged in predictable rhetoric against Latifi, claiming he had insulted their faith, but there is no sign that Latifi's position in Thaçi's cabinet is anything but secure. Latifi crossed verbal swords with imam Krasniqi in the aftermath of the latter's hate sermon against Mother Teresa two years ago, comparing the cleric with the Taliban. The writer Qerim Ujkani, as a party to the suit against imam Krasniqi, commented on the general situation in the Pristina daily Express, which is in the forefront of resistance to Islamist penetration, "The legal case [against imam Krasniqi] is now out of my hands, but I think that every manifestation of Islamic extremism that has taken root on our country is reprehensible, because it has no links either with Albanian culture or the historic Albanian identity." Ujkani warned that Ramiqi, whom he described as a "bandit" manipulated by the Islamists, had been financed by Hamas. Remarks on the lively Express online comment site were, as in the past, critical of Islamist intrigues. "Sefi" in Pristina wrote, "The agenda of 'Join!' is: to prove that every Albanian is a submissive Muslim; to indoctrinate the unemployed and purposeless youth; to undermine our institutions; to demand a mosque and Islamic center; to demand the headscarf, and later [Wahhabi-style] short pants [for boys] in the schools; to threaten institutions with action by 'every possible means;' to threaten indirectly (and later directly) everybody who refuses to 'join;' to introduce religion into state schools, with clerics in the schools . . . to change the laws, the constitution . . . to do nothing for Albanians or Kosova. Shame." The secularist stand of the Kosova government—which is led by veterans of the Kosova Liberation Army (KLA), including Thaçi and Buja—shows that the Albanians protected by U.S.-NATO weapons in 1998-99 were not and are not jihadists.